EBV architects is an architectural practice founded by Fabrizio Barozzi (Trento, Italy, 1976) and Alberto Veiga (Santiago, Spain, 1973) devoted to architecture, urbanism and interior design. 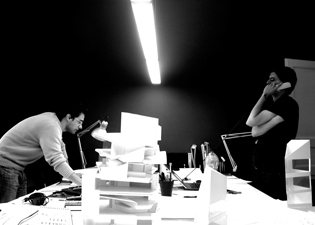 EBV architects has won numerous prizes in national and international competitions and several prizes including the AJAC prize for Best Young Catalan office in 2007, the LEAF award for best Young Architect of the Year 2007, and the Europe 40 under 40 Prize in 2008. EBV architects is selected as one of the 20 most important International Young Architects (ICON), 10 Best Spanish Young Architects (NIB), and Best Italian Architects (Rizoma). EBV is participating in the Ordos 100 project and the Bienale in Venice 2008.